The value to be compared against (if Comp is anything else than always) and/or the value to be written to the buffer (if either Pass, Fail or ZFail is set to replace). 0–255 integer. An 8 bit mask as an 0–255 integer, used when comparing the reference value with the contents of the buffer (referenceValue & readMask) comparisonFunction (stencilBufferValue & readMask). Default: 255. An 8 bit mask as an 0–255 integer, used when writing to the buffer. Note that, like other write masks, it specifies which bits of stencil buffer will be affected by write (i.e. WriteMask 0 means that no bits are affected and not that 0 will be written). Default: 255. The function used to compare the reference value to the current contents of the buffer. Default: always. What to do with the contents of the buffer if the stencil test (and the depth test) passes. Default: keep. What to do with the contents of the buffer if the stencil test fails. Default: keep. What to do with the contents of the buffer if the stencil test passes, but the depth test fails. Default: keep. 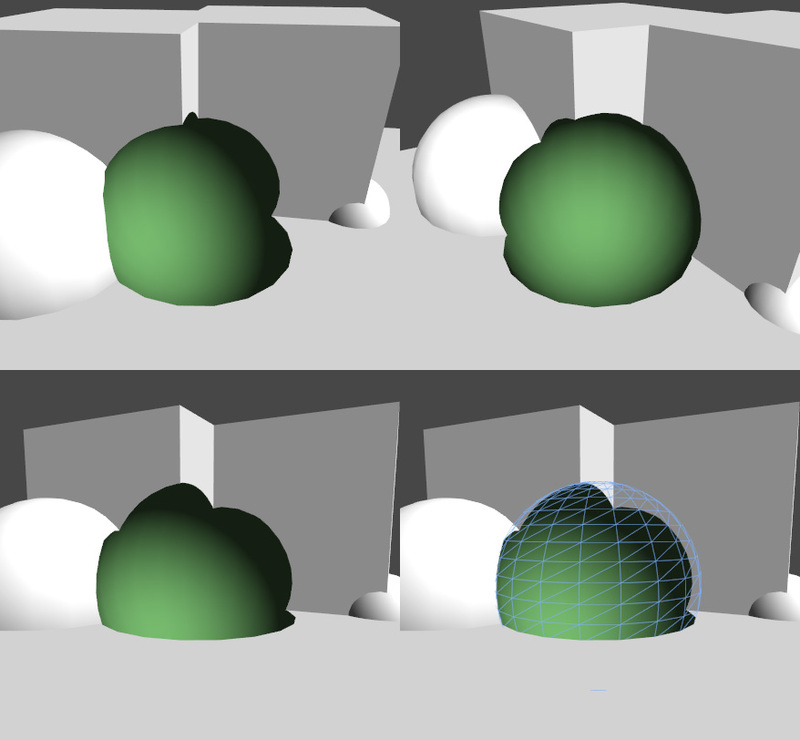 Comp, Pass, Fail and ZFail will be applied to the front-facing geometry, unless Cull Front is specified, in which case it’s back-facing geometry. You can also explicitly specify the two-sided stencil state by defining CompFront, PassFront, FailFront, ZFailFront (for front-facing geometry), and CompBack, PassBack, FailBack, ZFailBack (for back-facing geometry). Greater Only render pixels whose reference value is greater than the value in the buffer. GEqual Only render pixels whose reference value is greater than or equal to the value in the buffer. Less Only render pixels whose reference value is less than the value in the buffer. LEqual Only render pixels whose reference value is less than or equal to the value in the buffer. Equal Only render pixels whose reference value equals the value in the buffer. NotEqual Only render pixels whose reference value differs from the value in the buffer. Always Make the stencil test always pass. Never Make the stencil test always fail. Keep Keep the current contents of the buffer. Zero Write 0 into the buffer. Replace Write the reference value into the buffer. IncrSat Increment the current value in the buffer. If the value is 255 already, it stays at 255. DecrSat Decrement the current value in the buffer. If the value is 0 already, it stays at 0. Invert Negate all the bits. IncrWrap Increment the current value in the buffer. If the value is 255 already, it becomes 0. DecrWrap Decrement the current value in the buffer. If the value is 0 already, it becomes 255. See in Glossary path following the deferred path (e.g. transparent objects or objects without a surface shader) will set their stencil state normally again. The first example shader will write the value ‘2’ wherever the depth test passes. The stencil test is set to always pass. The second shader will pass only for the pixels which the first (red) shader passed, because it is checking for equality with the value ‘2’. It will also decrement the value in the buffer wherever it fails the Z test. The third shader will only pass wherever the stencil value is ‘1’, so only pixels at the intersection of both red and green spheres - that is, where the stencil is set to ‘2’ by the red shader and decremented to ‘1’ by the green shader.